I LOVE the original covers...but, I wouldn't mind seeing the series back in print again either. Anyone seen this cover in the wild? I just was thinking...that cover is very "Paranormal Romance". 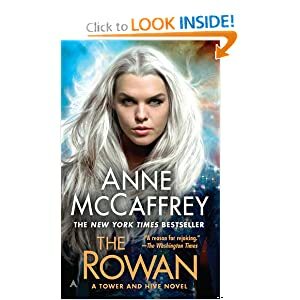 And then I realized...The Rowan, while not referred to as such, was technically one of the original "Paranormal" romances. Telepathy, telekinesis, teleportation--totally paranormal, before there was a sub-genre called "paranormal romance". Link to same cover on the Ace/Penguin site. Yep, I've seen this edition on ebay recently. I also thought it was knew. I thought the Rowan had a white streak, not a head of celtic hair. No, Damia had the streak. Rowan was white all over. Wrong color eyes, tho...Rowan had brown eyes.. I'm amazed anyone can remember! That's one thing I love about Anne - she does great characterisation, but barely spends much time at all on describing physical appearances unless it's relevant to the plot/characters at the time. Rowan is stated to have both gray and brown eyes in the books. It's a continuity error. But her original color was brown--either late "The Rowan" or somewhere in "Damia" is where her eyes turn gray. Edit: I just checked the google books version; it was late in "The Rowan" that gray/silver eyes showed up. It states that Rowan got them from her mother. But, although I can't find a source (google books only shows the first five occurrences of a term) I'm still fairly certain she starts out early in the book with brown eyes. WOW!! !...what an image on that new cover...not bad but not exactly what I have always imagined. I do remember the white hair and the brown eyes too. What a set of movies that series would make....need to re-read this series again soon. Anne was about the first one of modern authors to put romance in the paranormal and in science fiction as well. I think the new cover is stunning but it doesn't tell a story as much as the original one did. It's just a beautiful girl with a "bite me" expression. BTW, I talked with Anne about us doing a third Barque Cats book to pick up where the other one left off, even if we are self publishing it. She was all for it so that may be happening before long. It would be a sequel to the other two and be available in ebook and POD format. Same authors, same storyline, just no publisher. Oh, and the e-book probably will be less than the 9.99 the publisher has been selling the other two at. Great news! I'll buy it Just picked up that catalyst audio book and am a few chapters in. Most e-books can be read on a normal computer (with the addition of the right software, naturally), can't they? I'll still take the *Real* thing, whenever possible...I like the feel and smell of books and that just isn't happening with a computer. The only thing that e-books seem to offer of any good over a real book, is that you can make the printing larger for those that have a problem seeing the smaller print...and that's great for those that need it. It's also much easier to search for things than if you had to skim back and forth. Or you know something's in one of five books but aren't sure which one. With my Kindle, I can search all of them at the same time if I want to. Like you, I prefer the original covers, but I am all for new covers if it keeps the Talent series on the bookshelves and continues to introduce them to new readers. Looks nothing like Angharad, the face is far too wide, it's always very apparent when the artist has no clue of the character's description and that one surely doesn't. The art by Romas from the original 90's editions are always "canon" and a good bet at what the actual characters looked like.